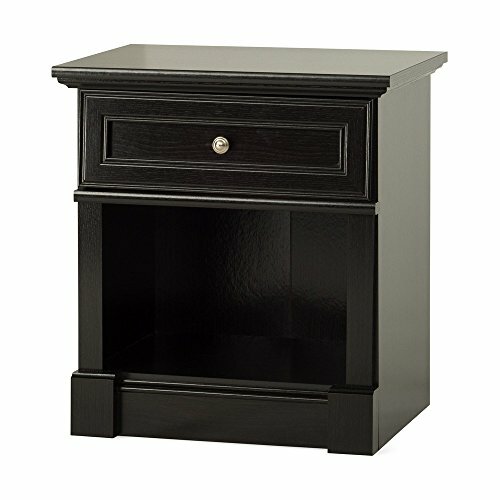 The Child Craft Updated Classic Ready-to-Assemble Night Stand is timeless and formal, yet versatile and liveable. The warm finish brings the detailed trim work to life, and although your little one may not appreciate all these traditional nuances in the nursery, you most certainly will. Night Stand includes one drawer with bottom storage shelf. Versatile Mix-n-Match styling matches a wide variety of crib designs and nursery decor. Drawer has easy glide metal runners and safety stops featuring patented T-lock assembly system Night Stand is constructed from medium density fiberboard and particle board with laminate Night stand includes 1 drawer and open shelf for additional storage This ready-to-assemble night stand is made for Child Craft by Sauder Woodworking Co. and is primarily made with engineered wood finished in a decorative laminate. The Child Craft crib and dressing table that match the finishes of the Updated Classic chests are primarily made of solid wood and wood veneers. Colors and finishes of the two construction methods are matched as closely as possible, however, some variations exist. Please look closely at the colors and finishes of the items you are combining. This item will arrive in a Sauder carton.